Almond Milk is a great alternative to dairy if you are lactose intolerant. It is also free of gluten, soy, low in calories, and tastes great in smoothies. But why would you want to make your own almond milk if you can just buy it from the store? Sure you can forgo the hassle and pay $3 for a carton yourself, or you can get the most out of your almonds if you’re going on a detox from dairy and wheat by making your own milk and flour from the leftover pulp. It’ll also save you some money in the long run. The first thing that jumped out to me was the added sugar. 15 grams for 1 serving cup?! 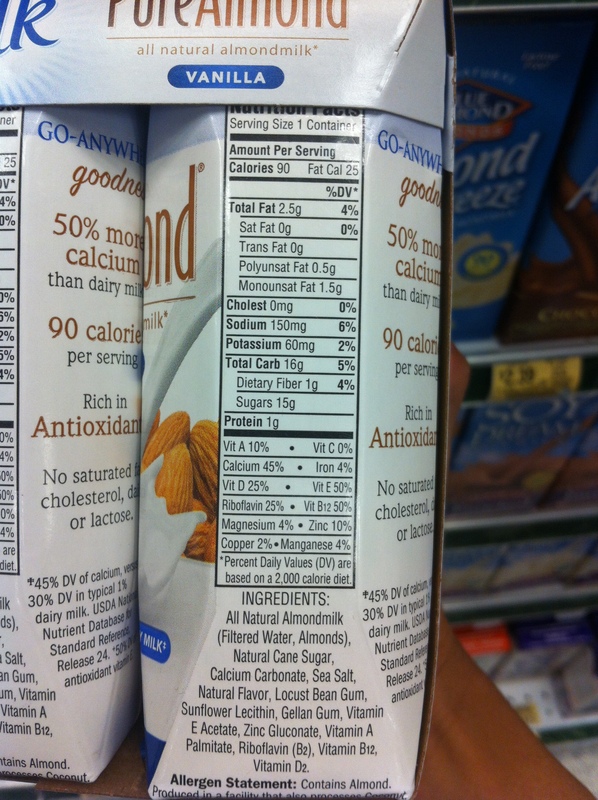 The recommended allowance for sugar by the AHA is 24g-36g total in a day. I quickly looked to see if they had an unsweetened version, but no bueno. I came home and went on the Silk website and found that they actually do have a unsweetened version, however they probably didn’t sell very well at my store, (no sugar) no surprise. If you do choose to purchase the unsweetened version but still want a little flavor, just not the 15g full, you can go ahead and sweeten it with a little stevia or agave nectar. Just don’t go overboard. Remember 1 teaspoon is roughly 4 grams. Directions: Put ingredients into a blender and blend on high. You only need a small dash of the vanilla extract since the flavor it is so concentrated. Once you let the blender run for about 30 seconds take a bowl, your cheesecloth or a clean pillowcase and drain the almond milk and let the pulp catch in the cloth. Squeeze the cloth until all the milk has been caught in the bowl. Take a taste and adjust the flavor to your liking if needed and store in a mason jar in your fridge for up to a week. As for the pulp, evenly spread it out over a plate or tray. Leave it out in the sun to dry out for a day(make sure it’s not humid). For more information on how to do this visit: How to make Almond Flour.